Pope Innocent III (ca. 1160-1216) - Pope Innocent III is widely considered to be the most powerful Pope of the Middle Ages; and because the Papacy reached its height in the Medieval Period, he was quite possibly the most powerful Pope ever. What made him so powerful was his attempt (at which he often succeeded) to exercise authority over the kings of Europe (as opposed to just the clergy). His reign lasted for 18½ years from 1198 until his death in 1216, which was one of the longest in history. And in that time he shrewdly wielded power through the use of an ancient edict seldom utilized before his tenure. It was known as an interdict. The Pope's big hammer has always been excommunication in which he could expel any member of the Catholic Church whom he believed was not obeying the tenets of Catholicism. But that was an all or nothing proposition which often came at great political cost. An interdict was sort of an "excommunication light". By issuing one, Innocent denied certain rites to a person or group without actually booting them from the Church. In his time as Pope, there are three great examples in which he issued interdicts to great effect. In 1198, shortly after his election, he issued one on the Kingdom of Norway for conflicts King Sverre had with the Church. It was lifted in 1202 with the king's death. 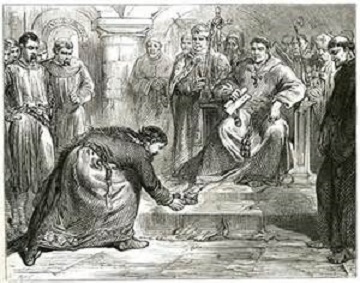 In 1200, he placed the entire Kingdom of France under interdict until King Philip II took his wife, Ingeborg of Denmark back, which he did later that year. And all of England was put under interdict for five years between 1208 and 1213 for King John's refusal to accept Stephen Layton's appointment as Archbishop of Canterbury. In addition to his exercise of the interdict, he convoked the Fourth Council of Lateran, which instituted several reforms of the Church. It was Pope Innocent who approved of Francis of Assisi's Franciscan Order in 1210. Finally, and most famously, he organized the Fourth Crusade, which turned out to be more a conflict between the Roman Catholic Church and Eastern Orthodox Christianity. When the Fourth Crusade failed, he issued a papal bull for the Fifth Crusade, which eventually happened, but he did not live to see it. One of his goals was to unite Christendom, but he did not succeed. In fact, the Fourth Crusade further divided East and West.